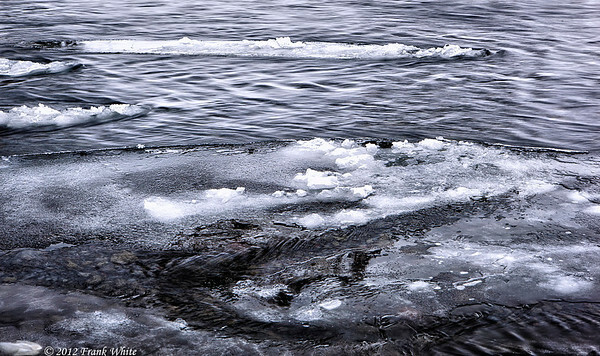 Photos taken during a March 2012 trip to Iceland with my friend Ann Redner. We rented a car in Reykjavik and drove for 6 days along the Ring Road, going about 1300km, more than 2/3rds of the way around the country, to Akureyri. The scenery is unbelievably beautiful and we often just stopped the car in the middle of the road to take photos. March is well off the tourist season in Iceland and we frequently went 20-30 minutes without seeing another vehicle once we were outside of a town. 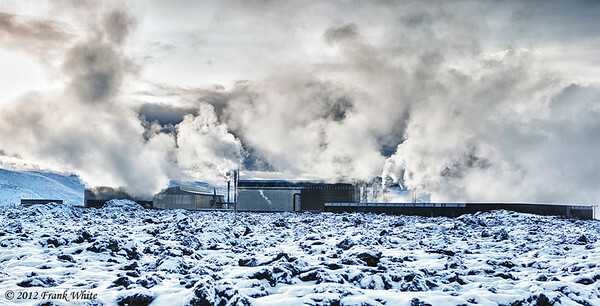 The geothermal power plant at the Blue Lagoon. 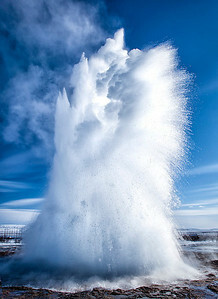 Outside the Blue Lagoon, between snow squalls. Looking over the Blue Lagoon thermal baths. It was below freezing so the fog from the warm water was very heavy. Bathers at the Blue Lagoon thermal baths. 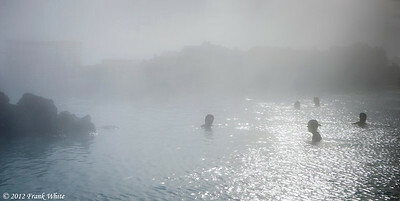 It was below freezing so the fog from the warm water was very heavy. 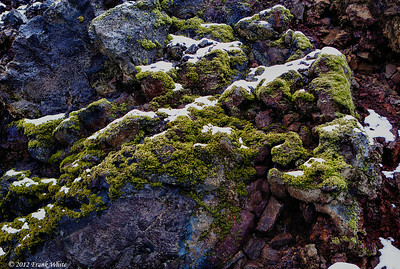 Moss on volcanic rocks, at the Blue Lagoon thermal baths. Overlooking the warf at Reykjavik harbor. 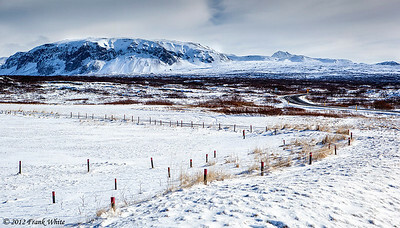 Along the road between Keflavik and Reykjavik. 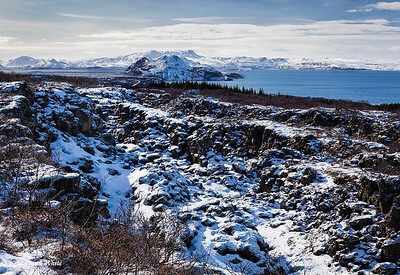 Along a ridge in Þingvellir National Park, with the Þingvallavatn lake in the background. 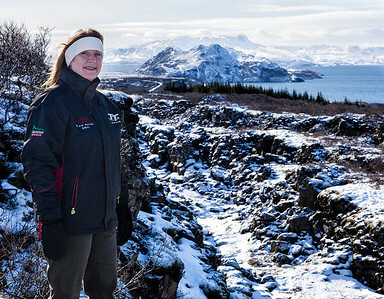 My friend Ann Redner at in Þingvellir National Park. 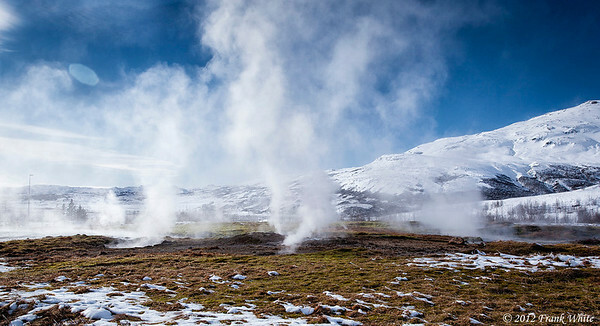 Steam vents in the Geysir geothermal area. 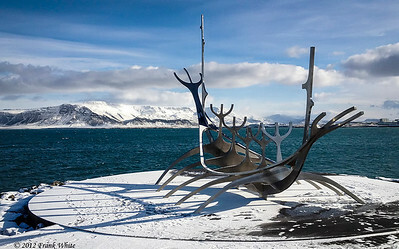 The famous viking ship sculpture on the Reykjavik harbor shorefront. It was a gorgeous morning, but it was about 28F with a 25+mph wind - cold!! 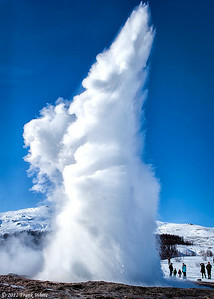 Strokkur geyser, just at the start of the eruption. 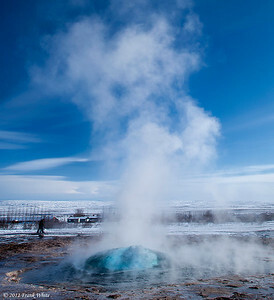 It is a "pool geyser" and the erruption begins suddenly as a large bubble of gas comes up from the crevase under the geyser pool, pushing it upward. The eruptions happen every 10-12 minutes. 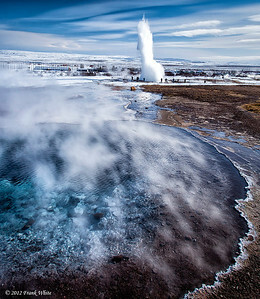 Overlooking one of the hot springs in the Geysir geothermal area, with Strokkur geyser erupting in the backgroud. Looking across the almost frozen river at dawn in Selfoss, southern Iceland. 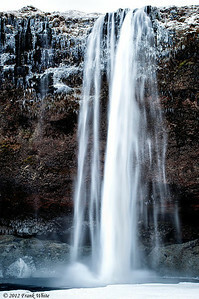 Seljalandsfoss waterfall drops almost 180 feet from the top of a cliff. You can climb stairs up part of the way up and actually walk behind the waterfall - when it's not coated with several inches of ice like it was when we visited in mid-March! Ice in the runoff of Skógafoss waterfall. 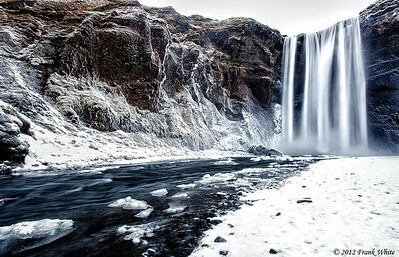 Skógafoss waterfall. The mist from the waterfall has coated the surrounding rocks and canyon wall with frost and ice. Unnamed waterfall along the southern Ring Road, near the Varmahlið farm. It's a couple of hundred yards off the road, but my sharp-eyed friend Ann (pictured here) spotted it and convinced me to drive down the gravel path to see it - what a great find!